Here are a couple of nice nano-images for the New Year. The first depicts a nanoscale metal-oxide donut, whose synthesis is reported in a paper (abstract, subscription required for full article) in this week’s Science Magazine. The paper, whose first author is Haralampos Miras, comes from the group of Lee Cronin at the University of Glasgow. The object is made by templated self-assembly of molybdenum oxide units; the interesting feature here is that the cluster which forms the template for the ring – the “hole” around which the donut forms – forms as a precursor during the process before being ejected from the ring once it is formed. 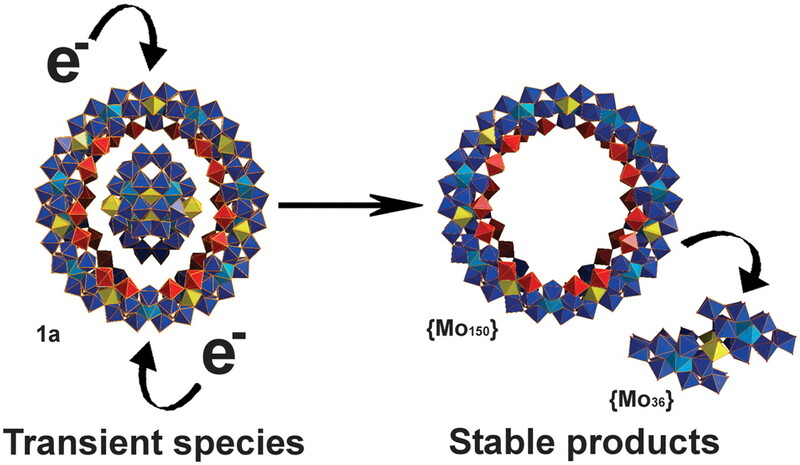 A molybdenum oxide nanowheel templated on a transient cluster. From Miras et al, Science 327 p 72 (2010). The second image depicts the stages in reconstructing a high resolution electron micrograph of a self-assembled tetrahedron made from DNA. In an earlier blog post I described how Russell Goodman, a grad student in the group of Andrew Turberfield at Oxford, was able to make rigid tetrahedra of DNA less than 10 nm in size. Now, in collaboration with Takayuki Kato and Keiichi Namba group at Osaka University, they have been able to obtain remarkable electron micrographs of these structures. The work was published last summer in an article in Nano Letters (subscription required). The figure shows, from left to right, the predicted structure, a raw micrograph obtained from cryo-TEM (transmission electron microscopy on frozen sections), a micrograph processed to enhance its contrast, and two three dimensional image reconstructions obtained from a large number of such images. The sharpest image, on the right, is at a 12 Å resolution, and it is believed that this is the smallest object, natural or artificial, that has been imaged using cryo-TEM at this resolution, which is good enough to distinguish between the major and minor grooves of the DNA helices that form the struts of the tetrahedron. A happy New Year to all readers. Previous Previous post: Why and how should governments fund basic research?